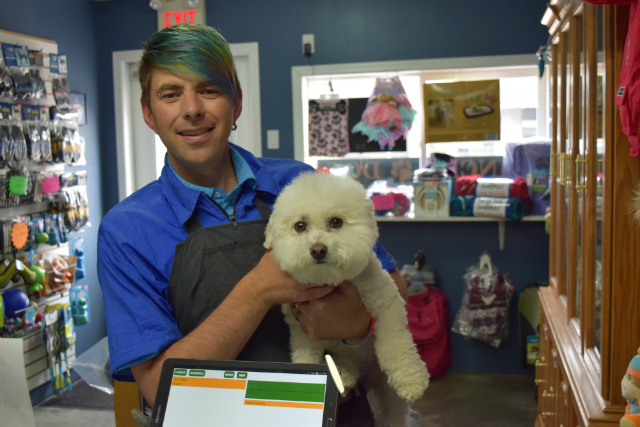 Cory's Dog Grooming and Spa was the first business to use POS-n-go to schedule appointments, track inventory and keep tight financial records. Owner Cory Muir said, "POS-n-go is easy to use and operate." Muir uses many of the business reports to keep track of sales, taxes and inventory. With almost 1000 different products, Muir really appreciates the inventory controls that are standard with POS-n-go. At Cory's you get fast and creative dog grooming along with a wide variety of dog accessories from shampoos, collars and combs to stylish coats and fancy bedding. Cory's also stocks the Paul Mitchell line of dog products. Located in Kimberley on Wallinger Avenue just west of Mark Creek, check out CorysGrooming.com, or call 250-427-2311 for an appointment. While you're there, be sure to look for Bella's current tail colour.